• A Torah Scroll is the holiest book within Judaism, made up of the five books of Moses. • There are 304,805 letters in a Torah Scroll. • Each page has 42 lines. • The Torah Scroll must be written by a specially trained pious scribe called a sofer. • A sofer must know more than 4,000 Judaic laws before he begins writing a Torah Scroll. • It takes about a year to write an entire Torah Scroll. 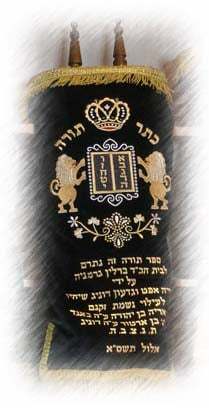 • Even a single missing or misshapen letter invalidates the entire Sefer Torah. • The Torah we use today in your synagogue is written exactly the same way the Torah was written the very first time by Moses 3,300 years ago. • The Torah is made of many sheets of parchment that are sewn together to make one very long scroll. • The entire Torah is written by hand, each letter is inscribed and individually formed with a quill and specially prepared ink. • The Torah is read at least four times a week in synagogues around the world. Get your personal letter in the Unity Torah Scroll! Thankyou sooo much this web is realy useful it helped me with my R.E homework!